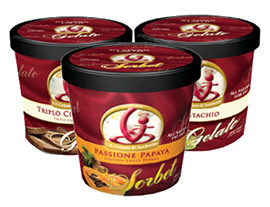 Distribution: Be the first in your region to distribute true Italian Gelato. What sets the San Gelato Café® Regional Developer program apart from many others is that our Regional Developers are granted the rights to distribute G.S. 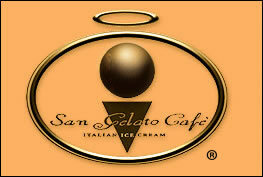 Gelato Sorbet and Gelato to the San Gelato Cafés® and third parties within their territories. This provides San Gelato Café® Regional Developers another potent revenue stream above and beyond what a typical franchise developer program offers. As another comparable advantage, this program also enables the Regional Developer to initiate revenue generation much sooner as the distribution center can start selling product while the Regional Developer's first café is still under construction. 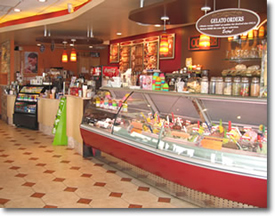 San Gelato Café® Franchising Group has developed a franchise system focused on creating aggressive, though sustainable, expansion through partnership with qualified Regional Developers. These individuals or organizations are awarded a territory which they develop and draw revenue from store ownership, selling and supporting franchises as well as distribution of Gelato, Sorbet and specialty products within the territory. As a San Gelato Café® Regional Developer, you not only have the benefit of running your own business but you will also have the assistance of a team of professionals devoted to your success. You will receive all of the support you would need to run your operation effectively and efficiently. This includes start-up and ongoing marketing support, extensive training, assistance in real estate analysis, dedicated corporate franchise development staff, and pre-established equipment vendor relationships to make sure your design and build-out process are cost effective and go as smoothly as possible. Welcome to San Gelato Café.® We hope that you find our concept as exciting as we do. We came to the United States from Italy 13 years ago with a dream; to share our cherished Italian culinary traditions with America. "This has truly been a great partnership for our company. I have never encountered a business that is so committed to quality, ensuring their customers are satisfied, and maintaining not just a business relationship, but a friendship. As we added G S Gelato to our menu, one of the G S Gelato representatives came to Delaware and spent an entire day with our managers on how to serve, market and explain gelato to our guests…. Their advice is invaluable and has made gelato the best dessert offering that we could pair with our menu! I look forward to a longtime friendship with Simona and Guido! " The Café: "Over 1 Million Served"
A San Gelato Café® gelateria is a franchised fast casual café specializing in the sale of Italian gelato, sorbet, and authentic Italian food and desserts with a 12 year track record of success. The concept focuses on the fast casual dining sector of the market, catering to a wide spectrum including families, teens, and the full range of the adult population who appreciate quality. The cafés feature a true contemporary Italian themed décor, setting our cafes apart from other fast casual business models. Please note this opportunity is only available in the US. Interested parties must have at least $100,000 liquid capital. 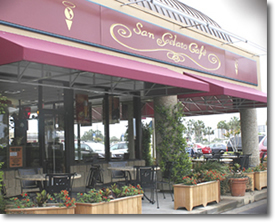 Click on Request Information button above for FREE information on how to start a San Gelato Cafe franchise today! Please Note: San Gelato Cafe franchises for sale, and other franchise opportunities, business opportunities, businesses and franchises for sale on this web site are not to be considered as an "offering", "franchise offering", suggestion or recommendation by GlobalBX. The franchises, businesses and business brokers seen on this web site submit their own individual content. This advertisement depends entirely on the truthfulness of the information provided by our advertisers which includes, but is not limited to, franchisers, franchises, franchise brokers, franchise consultants, business sellers and business brokers. As always, GlobalBX recommends that you consult a lawyer, financial consultant, accountant or professional advisor before buying a franchise or business opportunity or any type of business. By submitting this form and requesting more information, you have agreed to all terms and policies of GlobalBX and the business and franchise offerings listed here. Please review our Terms & Conditions for more information.